Monday March 6, 2017: Liz and Franco make a discovery, Robin is held captive, and Nora Buchanan arrives in Port Charles. Franco is with Liz in the parking garage. He worries about leaving her alone while Liv is on the loose. They chat about what happened to Sam. He informs her of Jake’s weird reaction to news about her and the curse he thinks she’s under. Liz is sure he’s just a ‘happy-go-lucky kid’ and rushes off to work. When she comes back down to get her phone, she discovers he’s the new parking lot attendant. That makes her proud. As they kiss, someone groans from a trunk. They break into the car and find Julian. Dante arrives in Anna’s hospital room and finds her checking her weapon. He’s concerned that she’s taking off during treatment. She’s not waiting around for Liv and wants to lure her out of hiding. Griffin walks in and doesn’t like what he’s hearing. Dante leaves for a meeting and they wish him luck. Under the doctor’s questioning. Anna tells him about her history with Liv. She’s determined to stop her before she goes after Robin. Liz pops in to tell them about Julian. Soon, Jerome is stabilized in a bed. Robin is thankful that Liv doesn’t know that Griffin exists or he’d be in trouble. He asks her to be careful. Once he’s gone, Julian wakes up. Anna asks if his sister did this to him. He tells her that Liv is still there. Valentin drops by the Crimson office and demands to know why Nina didn’t come home last night. Charlotte has been asking for her. Nina loves being her step-mother but she doesn’t love his secrets. After some bickering, he asks if they can present a united front at the custody hearing. She worries her emotional state may do him more harm than good. He suggests she think about what she wants and walks off. Nina mopes and thinks back over the things her husband has said to her. She calls Charlotte to apologize for not tucking her in and promises to make it up to her. Diane sits down at the Metro Court bar beside a woman who compliments her taste in purses. They chat and Diane explains she’s an attorney going up against Nora Buchanan. They discuss how Diane’s literary career is going and she starts talking about how great her clients are. Laura and Lulu arrive. Diane asks the woman for her name. Dante arrives, followed by Valentin, who introduces the woman as his lawyer – Nora Buchanan, played by Hillary B. Smith. The parties split up. Diane tells her clients that Valentin has a very good lawyer but theirs is better. Lulu gets a text from Maxie saying that Valentin and Nina are on the rocks. They need to act on this fast. Laura heads off. Meanwhile, Nora and Valentin talk across the room. Buchanan is eager to review Nina’s testimony. He worries she may not be joining them. She urges him to make up with her fast. Laura arrives in the Crimson office with a proposition for Nina. Liv gets on a hospital elevator with Griffin. He recognizes her as familiar. “You’re just as recognizable as the man I loved. Your father, Duke,” she says. 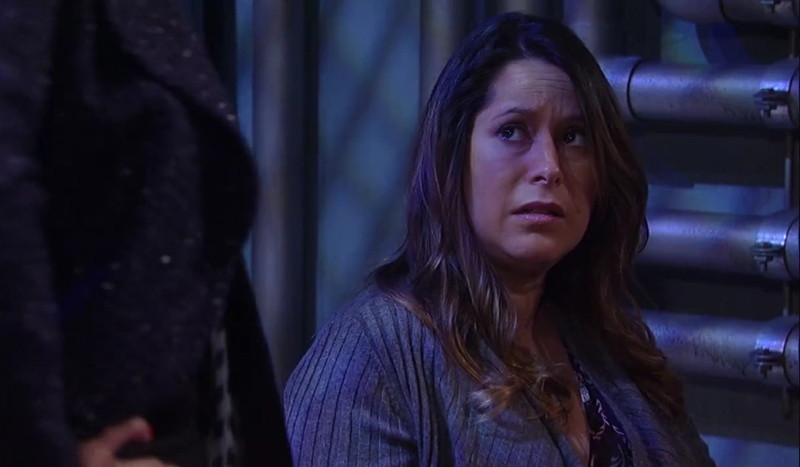 Alexis distances herself further from Julian. Laura makes a deal with Nina. Liv gets what she came for.